Cobblers’ defeat to Cheltenham Town on Saturday might have signalled the end of their play-off challenge for many, but manager Keith Curle is still holding out hope that his side can make a late dash for the top seven finish this season. Beaten for the first time since their 4-0 loss to Colchester United on February 2, Town have seven fixtures, including two of the current top four, to make up nine points on Exeter City who, with a game in hand, occupy the final play-off spot. I felt we could afford to lose one and draw one and win the other six so that’s the defeat out of the way – now we need to pick up six wins. 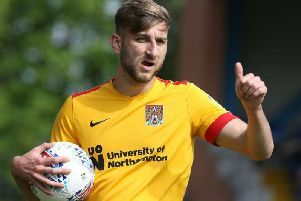 An improbable six wins from those seven games might well be enough for the Cobblers to sneak into seventh place but, even then, they would be reliant on other results going their way. However, whilst most supporters have given up hope of their side bouncing back to League One at the first time of asking, Curle will not do likewise until it is mathematically impossible. “It was a game that we lost within the run-in that we have,” he said after the defeat to Cheltenham. “In my mind, I felt we could afford to lose one and draw one and win the other six so that’s the defeat out of the way - now we need to pick up six wins. “If you get six wins, you take your chance. But we just have to focus on winning our games and every single one of them is winnable. Northampton embarked on an eight-game unbeaten run the last time they were beaten and Curle will be expecting a similar reaction following Saturday’s defeat at Whaddon Road - as long as they rediscover their ‘winning mentality’. “Having a winning mentality doesn’t mean that you enjoy it when you win and you don’t have the same elation when you get beat,” he explained. “That doesn’t make you a winner. Being a winner is somebody that can put demands on others and do the right things day in, day out, week in, week out. “They then demands on other people to make sure they’re doing the right things at the right times. “At the minute, we need to get back to that winning mentality because we’ve had that in the last four or five weeks - we’ve got on the front foot and we’ve had demands among ourselves to do the right things.